This is a model of the classic Ball Chair, also known as the Globe Chair, was designed by Finnish furniture designer Eero Aarnio in 1963. 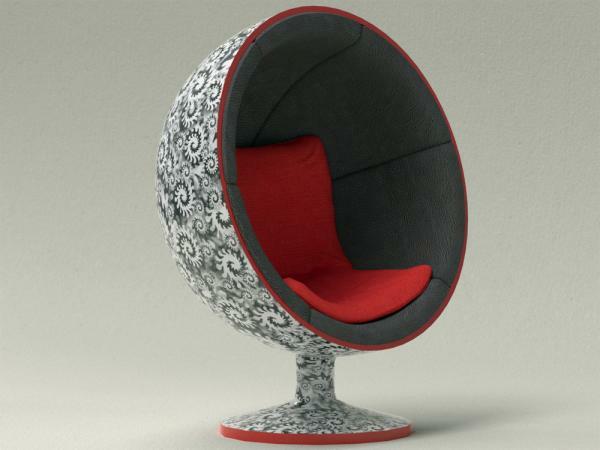 This chair is famous for its round shape and unconventional design, this chair has become a permanent fixure in popular culture. This model can easily provide a classic/modernist look and feel to your arch/viz interior renders, or it could also work very nicely as a character prop. The model is available as a native 3dsmax 2012 scene file (.max), and also in several scaled .obj formats, for importing easily into other applications, like Blender, Poser, or Daz|Studio. It comes complete with COLOR, BUMP, and SPECULAR texture maps, where needed. All textures are .jpg format, and sized to a high resolution of 2048x2048; suitable for high quality, close-up rendering. The topology is cleanly modeled from 100% quadrilateral polygons (Quads), with a detailed, but optimized poly count of just 12,480, and 12,740 verts. You are free to use or modify this object as you see fit, for use in your scenes as a room filler or character prop, or any other type of situation where you may need a quality furniture item to render. This model can be used for both commercial and non commercial renders. You may not, however, resell this object, or any derivative of it; individually or as part of a package/set. *** OBJ users: the POSER-specific OBJ version was exported with a scale conversion that should load with the appropriate scaling into Poser 9 and above. To ensure proper import into Poser, BE SURE to DE-select all check box options boxes in the Import Options dialogue. DESELECT the "Centered", "Place on Floor", "Percent of Standard Figure Size", etc. options in the import dialogue box after you select the poser .obj file, and then the object should load with correct scale into the scene. In DAZ|STUDIO, simply choose the Poser-scaled .obj version, and import with Poser Preset option from the import dialogue box. BLENDER users, obviously, choose the Blender scaled .obj. All other software applications may be best suited to import the standard .obj file. Oblomov56 (3 years ago) Inappropriate? Paul Sutton (6 years ago) Inappropriate? Thanks very much this is wonderful well done! My only critic would be that the base bottom edge should be thinner and with more polygons, to make it look more round shaped... excellent textures! Loveicy / Roni (6 years ago) Inappropriate? Very nice looking chair. Thank you for your gift to the community. Another wonderful prop. Thank you.